Following on from our previous coverage of the hi-hats, snare drum and ride cymbal - we now come to perhaps a kit's most misunderstood element: the tom toms, or toms, as they're usually abbreviated. The average drum kit will feature two or three toms, although more flamboyant drummers may elect to include many more. There are two types: rack toms and floor toms. By and large, rack toms come in diameters from 8" to 14" and are mounted on a stand protruding from the top of the kick drum or their own floorstands, while floor toms range from 14" to 16" and are held aloft on three legs. Both kinds can be fitted with heads on the top and bottom, or just the top, for a more 'barking' sound. In terms of their role within the kit in most styles of music, the toms are ancillary to the kick, snare and hi-hats. While that all-important percussive triumvirate is responsible for the beat itself, the toms are used to mark out the ends of phrases, for more prolonged fills and solos, or as an integral part of the main rhythm, their rounded, semi-melodic tones bringing depth, character and personality to the groove. In the following walkthrough, we'll show you how to get your tom toms fit for sonic purpose, and demonstrate all three of those musical functions. 1. Drummers tend to go for either two or three toms, with the extra tom in the latter setup making quite a profound difference to the character of the kit. Here's a noodling jazz solo first with a five- piece kit (three toms, kick and snare), then a four-piece (two toms), with hits to the high tom shifted to the mid one. 2. Tuning toms to the key of the track can be an important consideration, and I'm using Toontrack's Rock! 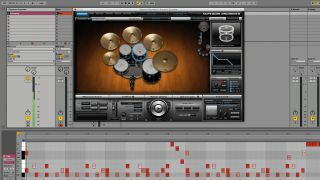 EZX, loaded into Superior Drummer 2 for just that reason. Here's a groove with two tom- heavy fills, first at the kit's default pitches, then with the toms tuned to the key of the accompanying bassline (D, B♭, G). 3. Another important consideration with the sound of the toms is their duration. A longer, more resonant set of toms might be well suited to rock, but it'll sound out of place in a drier funk- or dub-orientated kit. Here's our kit with its original toms; then with their amp envelopes shortened; then with the kick, snare and hats reduced too. 4. A straight-up roll around the toms may make for a perfectly good drum fill, but it's not a hugely interesting one. By mixing toms up with other drums, exciting and ear-catching possibilities are revealed. Two of our favourites are crescendoing floor tom/snare flams, and fast linear patterns between the toms and kick. 5. So far, we've demonstrated the toms in the context of fills and soloing, but they can also be used in lieu of the hi-hats or ride cymbal to fill the spaces in a groove between the kick and snare. You'll need to make sure those cymbals are silent for this (a drummer only has two hands at most), although pedalled hats are fair game. 6. Generally speaking, as house, techno and the like don't use drum fills in the same way as 'live' genres, electronic drum tracks can employ toms within the main fabric of the rhythm. Think of them more as supporting percussion, bringing a suggestion of melody to the part, as heard in this classic-style TR-909 line.